A lot of cities and towns across Massachusetts have voluntary or mandatory water restrictions now, but Worcester has taken it to the next level. No car washing, no lawn watering, even fountains aren't running. 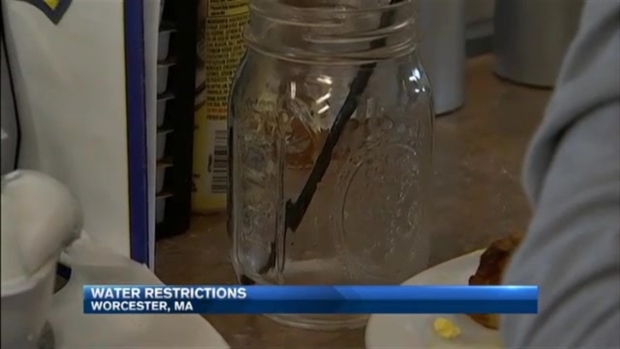 If you head to a restaurant this weekend, you won't get a glass of water without asking. The 10 reservoirs where they get their water are usually at 80 percent capacity, now they're at 55 percent and some of them are bone dry. City officials say they have to conserve and are calling for a total outdoor water ban, which includes cutting off water- involved training at the fire department and telling restaurants to crack down on how much tap water they give out. "I have a lot college students in here who drink pitchers," said Kim Kniskern of Miss Worcester Diner. "I just let them know about the water ban, most of them are pretty receptive." The city is handing out fines to anyone who violates the ban. Fortunately, Worcester will not run out of water completely as there is a plan in place to purchase water from other sources should the drought get even worse. Going that route will be expensive, however, costing more than $1 million a month.